Use this settings page to access the configuration your calendar. Site Settings control all aspects of your calendar, with the exception of events. Events are administered in the Events Dashboard. You can access site settings by clicking on the gear icon to the left of your name in the administrative area of the application, or by clicking on your name and selecting site settings from the drop down. In this configuration area items that are shared by all sites are configured and maintained. All of your sites will share a centralized payment gateway to provide online commerce. Additionally, global administration allows you to create a centralized library of categories and locations that can be shared by all sites. In this administration area items that are unique to the site are configured and maintained. Each site can have its own, unique: users, categories, locations, and content sharing. Users are people who configure, request and approve events, and access private calendar sites. A user could range from the administrator of the site, event authors, or simple view-only rights. Within “users”, there are four Site Role Groups : Site, Event, User, and Facility. Various levels of permissions can be assigned within these Site Role Groups. These roles control what the user can do. Available Permission levels include: Admin, Author, Viewer, and none. 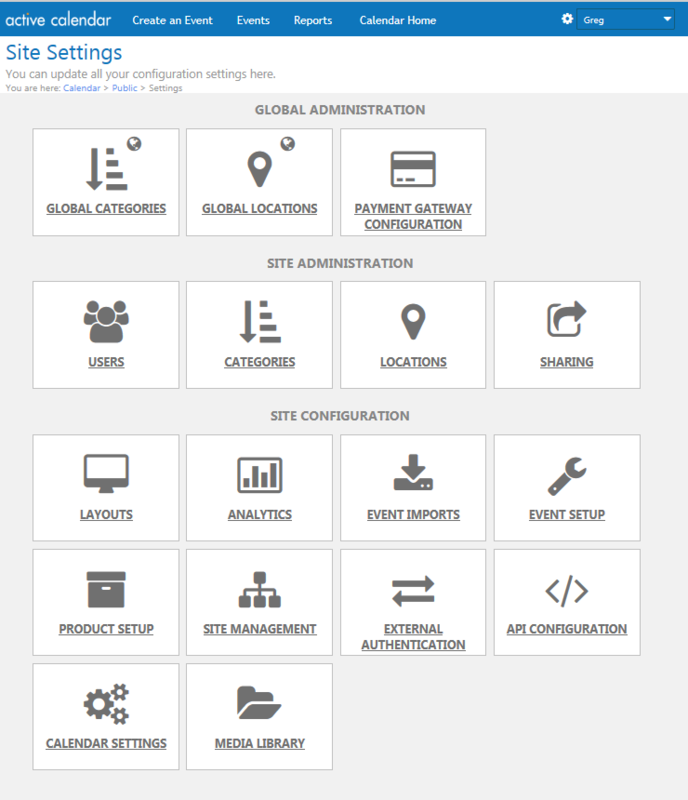 Categories provide structure, for grouping events and enhancing event searching. The event author applies one or more categories to each event. Categories are a fixed taxonomy structure, up to ten levels deep, that allows assigning predefined values (created and maintained by site administrators) to your events. Your Calendar Site can have an unlimited number of categories. This area allows for adding, editing, and removing facilities from your list of locations. Similar to Categories, Locations are a fixed information structure created by admins and assigned to events by event authors. Locations are searchable by a site visitor. In this configuration area items that are unique to the site are configured and maintained. Each site can have its own, unique: layout, google analytics account, event imports, event custom fields, products, external authentication, api's projects, calendar and site settings, and media library. Layouts control how your site is stylized, and how the calendar site will appear to a site visitor. Layouts include your branding and logo. This option allows you to choose any of the existing layouts on the website, or upload a layout. Layouts are controlled by your site administrator. Analytics lets you sync calendar pages with your Google Analytics account. This configuration uses your tracking code and account ID to report information back to Google Analytics, providing detailed information about your calendar site. Configuration of this area requires a Google Analytics account, speak with your system administrator if you don’t know your Google Tracking Code or Google Account ID. Event Publisher allows for you to add events from other calendars using its import feature. The import feature supports adding events from other Active Data Products, iCal (.ics) files, or via specific XML and CSV formats. Event setup lets you configure additional fields to be associated with events and shown to visitors. These are custom fields unique to your calendar site, they can be used to help standardize events entered by event authors, or by used to help assist in search. Add additional information, structure, and taxonomy. These fields are displayed publicly, to your site visitors when browsing events. Product Categories: for the creation of a categorization structure for items you add to events. You can add as many product categories as required. Product Fields: allow for creation of a library of questions to collect information when a user purchases a product assigned to an event. Product Templates: allow for the creation of preconfigured items with set quantities, names, and information collection settings. Site Management controls settings unrelated to events in your calendar. This includes the scope of your categories and locations, and set site-global parameters like default time zone, layout, and email settings. Control how users access your calendar site via a user ID and password. By default user accounts are created and managed in Event Publisher. However, Event Publisher supports creation and management of users from external sources via SAML. Event Publisher's API is a RESTful HTTP API, meaning all API functions are called using a URL request and response. To request data from the API, you can call a Web URL using your favorite browser or programming language, and the API will return back data back to you in the format you specified. This document outlines the requirements for generating an API URL, the different types of URLs, and the responses you will receive. Configure your calendar's behavior when a visitor selects search. In this area you will determine which fields will be available to your calendar visitors when searching for events.